Vice Chairman of Verwood Parish Council. 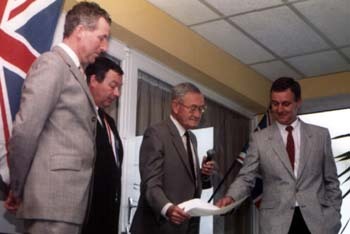 Address Given by Mr Gordon Thorne - Twinning Chairman. The sight of 43 (or 44 if he included himself) happy residents of the village aboard or about to board the coach to Champtoceaux on the evening of the 11th May might well have seemed reward enough to to Gordon Thorne, Chairman of our Twinning Association for all his hard work and enthusiasm since 1980 when the possibility of twinning with our French counterpart was first thought of. We hope it was. The event was a resounding success, just as was the visit of our French friends to us almost 12 months ago. We hope that exchange visits individually and collectively will be mounted from this point on so that the relationship which has been established will grow in friendship. Here are a few personal impressions of the visit which have been made at that time. 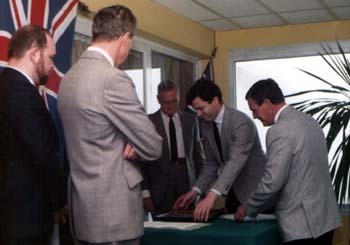 Taken at the Charter signing ceremony in Champtoceaux. My abiding memory is of the friendship and hospitality extended to us collectively by the community and the excellence of the arrangements made to ensure this would be a memorable occasion. Not far behind, for me, come the individual acts of friendship and hospitality which we were privileged to receive. Also, what a pleasant surprise it was to meet representatives of Niederheimbach, Germany, the other twinned town of Champtoceaux. They presented us with a plaque and some Rhein wine. The commemorative plaque erected on the outskirts of Champtoceaux features Niederheimbach and Verwood. If I am to extract two other noteworthy memories from the veritable basket of them with which I returned, I would choose Jon Palethorpe rehearsing us in the coach for the singalong which unknown to this writer we were to perform, conducted and accompanied by Jon, at Sunday's lunchtime concert. 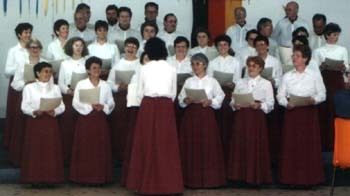 The fortunes smiled upon us inasmuch as we 'performed' before the 'Val Chantant', Champtoceaux's own well rehearsed and entirely delightful choir which entertained us with some very well chosen and varied items from their repertoire. The difference between them and us was marked. The other memory is of Dr. 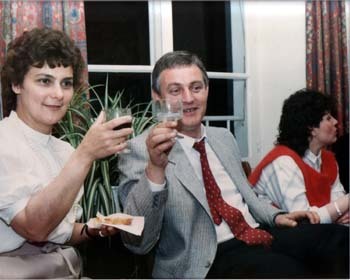 Else Martin enjoying herself so hugely with husband Tony. She let her hair down figuratively as well as literally, and why not? I doubt whether it added anything to her week-end when she was called upon to exercise her professional skills on the inbound ferry when over the loudhailer came the message 'If there is a doctor aboard will he . . . . ' We felt a stirring of pride that our own doctor was there to minister to some unfortunate. One of the things which made a great impression on the Verwood party was the entirely unsolicited effort of Champtoceaux's premier patissier M. Gaultier in creating a huge cake which he exhibited in his shop window. Topped with marzipan roses, the cake was decorated with the town's coat of arms and our logo with the appropriate words commemorating the event. A number of us were invited by Mme. Gaultier to a party at which the cake was consumed - it tasted even better than it looked! 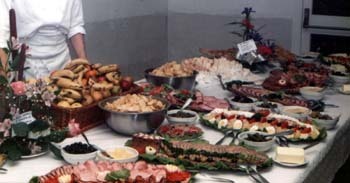 The Superb quality of the food. There were certain hangovers from the Twinning trip evident among those taken up with the traditional French bonhomie. Certainly the wine was good and plentiful but it wasn't that sort of hangover, but the continuation of French-style greeting. Even casual acquaintances shake hands and say "Bonjour" on meeting and friends endorse this with two kisses on each cheek — quite time consuming but fun! If only the British weren't quite so reserved — we could all be embracing at every street corner! Very few of those who went were fluent in French, so it was necessary to speak as briefly as possible but to try to get the message across. It was the same for our French hosts, one of whom, male, was concerned that his lady guest might be feeling tired with all the excitement and asked simply "Do you want to go to bed?-" This brought howls of laughter from the French and English alike. Well, we thought he was concerned for her tiredness, anyway! But such are the pitfalls of a twinning exchange and it's all part of the fun. Our hosts were warm and charming, our visit full of interest and enjoyment. The way is now paved for more visits and exchanges. 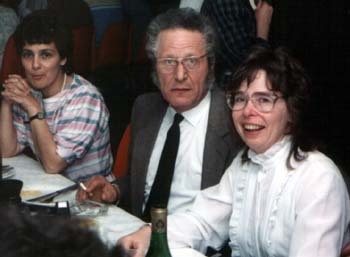 (Vivien Clifton, M. Claude Papin (Bank Manager) and wife of Niederheimbach Mayor. This picture was chosen by "Verwood Viewpoint Magazine" from the many that were taken as it typifies the happy atmosphere that existed throughout the weekend. It really was great fun. but didn't see much sun. as did the wine of France. to make the bond grow stronger. we nearly missed the ferry! delivered at the Twinning Ceremony in France , May 12th 1985 . Mr. Mayor, dignitaries, citizens of Champtoceaux and of Verwood, friends. Of course, I must avoid using Franglais because I understand that too many expressions of this sort in your language are not popular - expressions like "un whisky soda". "Le pull-over", "Le w.c." However, let me say that there is another sort of "Franglais". the thousand or so French words and phrases that have been adopted into the English language and which we try to pronounce in the French way, for example, "morale", "debris". "ballet", "entre nous", "bete noir" and "enfant terrible". 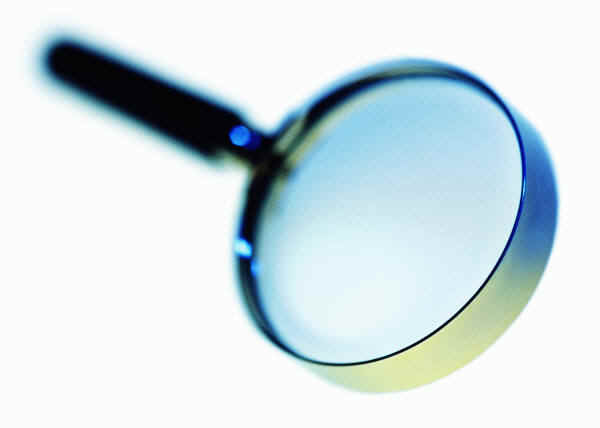 We use them frequently and are pleased with ourselves when we do. It was five years ago when I first became involved in the possibility of twinning Verwood with a small town “sur les Bords de la Loire” — Champtoceaux. MANITOU a Company which manufactures site-lift trucks and with an operation in the U.K. decided to come to an industrial estate on the outskirts of our town. This Company has its headquarters in ANCEN1S. A director of the Company, Mr. Gordon Himsworth, an Englishman, contacted (I cannot recall exactly how) four of our Parish Councillors, Gordon Thorne, our Chairman, Ron Curd who is also here, Cyril Dale and me. Gordon Himsworth, a very persuasive gentleman, told us among other things that Champtoceaux a “sous-prefecture” of Ancenis, has to offer a very good camping site, an old Roman Fort, les plaisirs de la Peche, many and varied gastronomic delights, a beautiful site on the Loire, four hotels and M. Alain Levoyer. He did not exaggerate. In no time at all we, the aforementioned four, were able to interest our Parish Council in the project and to persuade them of the advantages which would flow from twinning our two towns and that it deserved financial support as long as this did not include paying for Councillors to travel, dine and wine at public expense, an undertaking everyone involved was happy to give. Exploratory visits from residents from each community to the other took place and then last year in Verwood we had the great pleasure of receiving your Mayor, dignitaries and citizens over what was to become a happy, pleasurable and memorable weekend. 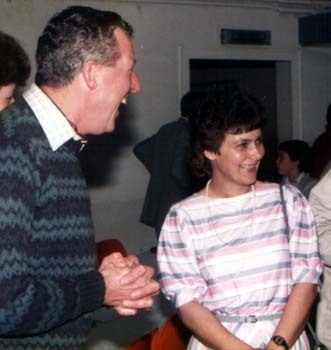 When I joined the Committee of the Verwood Twinning Association, it was on the clear understanding that I did not intend to take part in the exchange visits although I was prepared to assist in any way 1 could with the arrangements. Notwithstanding, here I find myself, honoured to be substituting for our President, Harold Witt, Chairman of our Parish Council, who is not able to be with us. It gives me the greatest possible pleasure to convey to you his good wishes and that of his Council and to express on their behalf the hope that the bonds which have been forged between our two communities, will strengthen over the years to come. 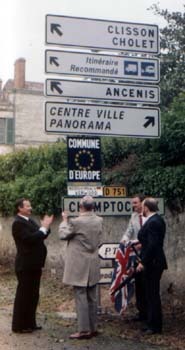 Long live Champtoceaux, long live Verwood, long live the twinning of our two towns." As Chairman of the Verwood Twinning Association, I would like to thank my committee and all those members who recently visited Champtoceaux for the Official Twinning Ceremony, for the way in which they organised the unforgettable weekend, and also for the marvellous spirit in which it was undertaken. Not only were there many new friendships established with our French counterparts, but also many new friends made within the community of Verwood. Some people may consider the Twinning Association serves no good purpose, but after the scenes from Brussels recently, I feel such events as the twinning can only foster better relationships and peace among ordinary people of different nations of the world. Thanks to all the party and our Parish Council representative, Bill Williams. 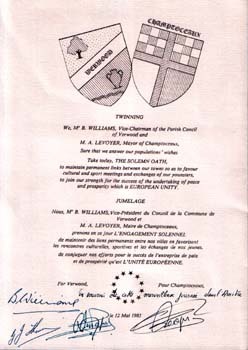 This document was one of several given to some members of Twinning during the 1985 Verwood visit to Champtoceaux. The one shown below is the document given to me by Alain Levoyer (Mayor of Champtoceaux) and signed by the other Dignitaries. 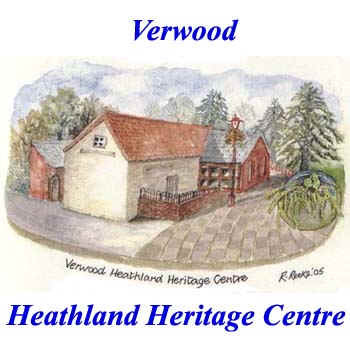 Other documents reside in Verwood Library and Verwood Town Hall. "En souvenir de cette marveilleux journee dans l'Amite" Alain Levoyer (Mayor of Champtoceaux). Mr Claude Papin (President of the French Twinning Association). The Oath is written in French and English as shown below. and prosperity which is EUROPEAN UNITY.